Altitude diving is underwater diving using scuba or surface supplied diving equipment where the surface is 300 meters (1,000 feet) or more above sea level (for example, a mountain lake). The U.S. Navy tables recommend that no alteration be made for dives at altitudes lower than 91 meters (300 feet) and dives between 91 meters and 300 meters correction is required for dives over 44 meters sea water (145 feet sea water). Altitude diving is significant in diving because the depths and decompression used for dives at altitude are different from those used for the same dive profile at sea level. Special consideration must be given to measurement of depth given the effect of pressure on gauges. The use of bourdon tube, diaphragm, and digital depth gauges may require adjustment for use at altitude. Capillary gauges have been shown to be a conservative method for measurement of compensated depth at altitude. Modern dive computers detect changes in altitude and automatically adjust their calculation of a safe decompression regime for a dive at that altitude. If an altitude-aware computer is not used, altitude decompression tables must be used. At altitude, atmospheric pressure is lower than at sea level, so surfacing at the end of an altitude dive leads to a greater relative reduction in pressure and an increased risk of decompression sickness compared to the same dive profile at sea level. The dives are also typically carried out in freshwater at altitude so it has a lower density than seawater used for calculation of decompression tables. The amount of time the diver has spent acclimatising at altitude is also of concern as divers with gas loadings near those of sea level may also be at an increased risk. The US Navy recommends waiting 12 hours following arrival at altitude before performing the first dive. The tissue supersaturation following an ascent to altitude can also be accounted for by considering it to be residual nitrogen and allocating a residual nitrogen group when using tables with this facility. The most common of the modifications to decompression tables at altitude are the "Cross Corrections" which use a ratio of atmospheric pressure and sea level to that of the altitude to provide a conservative equivalent sea level depth. The Cross Corrections were later looked at by Bassett and by Bell and Borgwardt. Hennessy formulated that it was possible to convert standard air decompression tables for no-stop diving at altitude or from a habitat based on phase equilibration theory. Albert A. Bühlmann recognized the problem and proposed a method which calculated maximum nitrogen loading in the tissues at a particular ambient pressure. Wienke proposed guidelines for decompression diving at altitude in 1993. Egi and Brubakk reviewed various models for preparing tables for diving at altitude. Paulev and Zubieta have created a new conversion factor in order to make any sea level dive table usable during high altitude diving in 2007. Repetitive dives should be conducted in the same manner as other dives including "Cross Corrections" for altitude. The US Navy does not allow repetitive diving for surface-supplied helium-oxygen diving and a 12-hour surface interval is required. An 18-hour surface interval is required if the dive requires decompression. In addition to making depth adjustments using the Cross Conversions, dives at altitude often require pre- and post-dive altitude ascents which must be taken into consideration. 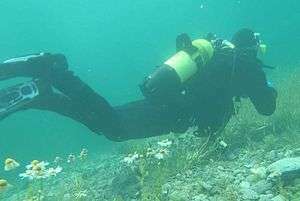 Several methods for performing post-dive ascents are used. One is to adjust the dive times needed for an altitude ascent. Another is to use surface intervals to allow for an ascent. Lago Licancabur, site of world's highest ever altitude dive. Although no official records are recognized, until 2007 the highest recorded altitude at which a scuba dive had been conducted was 19,300 feet (5,900 m), by a team led by Charles Brush and Johan Reinhard in 1982 in Lago Licancabur. This record was equalled by a team led by Nathalie Cabrol (SETI Institute/NASA Ames) in 2006. That year, Cabrol set the highest recorded altitude scuba diving for women. She also free dived at Lake Licancabur in 2003 and 2004. 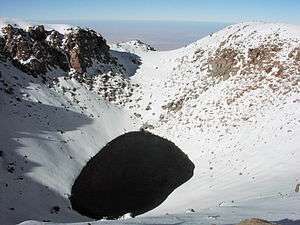 In 2007, a new record was set in the small lagoon located near the summit of Pili Volcano, at just over 6,000 metres (20,000 ft), by Philippe Reuter, Claudia Henríquez and Alain Meyes. The deepest known staged decompression altitude dive was conducted by Nuno Gomes at Boesmansgat (Bushman's hole) in South Africa. Conducted at an altitude of approximately 5,000 feet (1,500 m), Gomes dived to a depth of 927 feet (283 m). Gomes's decompression schedule was calculated as being equivalent to a dive to 1,112 feet (339 m) if it had been conducted at sea level. Starting off the coast of Peru the diving equipment was tested and practice dives were made. Poor weather interrupted the practice session. Departing from the Port of Matarani Peru on the Pacific Ocean, two mini Submarines were unloaded onto rail cars. The train climbed up the Andes mountains to over 14,666 feet at Crucero Alto Peru. Descending down the mountain by rail they arrived at Lake Titicaca 12,507 ft. They visited ruins in Peru before continuing south to Copacabana, Bolivia. Where a parade was held in honor of the event. Ruins were visited at Isla del Sol and Isla de la Luna, Then dives were made in the area visiting minor underwater ruins. The expected rich schools of fish were not found. For the next four weeks dives were made in the area. During these dives many dead fish were found and collected. Large toads were found and noted. Samples of the dead fish and the toads were sent to The Oceanographic Museum (Musée océanographique) in Monaco for study. To help map the bottom of the lake Dr Harold Edgerton arrived from MIT with depth mapping equipment. After mapping the lake an area was selected for the subs to dive in. Floats were added to the subs. The two mini subs were launched with Jacques Cousteau and Albert Falco at the controls. Divers dived with the subs to a depth of 100 feet. The subs continued down to a depth of 400 feet. The toads were found at 400 feet below water. After the sub dive the results for the test on the dead fish arrived from Monaco. When trout were introduced into the lake in 1940 parasites were introduced with them. ↑ Prior to this the highest scuba dive in the continental US was a 1997 dive by Peter Hemming and David Moore at California's Tulainyo Lake, altitude 12,818 feet (3,907 m). ↑ Brylske, A. (2006). Encyclopedia of Recreational Diving (3rd ed.). PADI. ISBN 1-878663-01-1. 1 2 Murphey, M. (1991). Advanced Diving: Technology and Techniques. Montclair, CA: NAUI. pp. 150–56. 1 2 3 4 5 US Navy Diving Manual (6th ed.). US Naval Sea Systems Command. 2006. Archived from the original on 2 May 2008. Retrieved 2008-04-24. ↑ Morris, R.; Berthold, R.; Cabrol, N. (2007). N. W. Pollock; J. M. Godfrey, eds. Diving at Extreme Altitude: Dive Planning and Execution During the 2006 High Lakes Science Expedition. 26th Annual Scientific Diving Symposium. Diving for Science. Dauphin Island, Ala.: American Academy of Underwater Sciences. ISBN 0-9800423-1-3. Retrieved 2008-06-14. ↑ Mackay, RS (1976). "Automatic compensation by capillary gauge for altitude decompression". Undersea Biomed Res. 3 (4): 399–402. ISSN 0093-5387. OCLC 2068005. PMID 10897866. Retrieved 2008-04-24. 1 2 3 Brubakk, A. O.; Neuman, T. S. (2003). Bennett and Elliott's physiology and medicine of diving (5th rev. ed.). Saunders Ltd. ISBN 0-7020-2571-2. ↑ Cross, E. R. (1967). "Decompression for high-altitude diving". Skin Diver. 16 (12): 60. ↑ Cross, E. R. (1970). "Technifacts: high altitude decompression". Skin Diver. 19 (11): 17–18, 59. 1 2 Bassett, B. E. (1979). And yet another approach to the problems of Altitude Diving and Flying After Diving. Decompression in Depth Symposia. Santa Ana, California: Diving Science & Technology Corp. pp. 38–48. Retrieved 2008-04-24. ↑ Bassett, B. E. (1982). "Decompression Procedures for Flying After Diving, and Diving at Altitudes above Sea Level". US Air Force Technical Report. SAM-TR-82-47. Retrieved 2008-04-24. ↑ Bell, R.; Thompson, A.; Borowari, R. (1979). The theoretical structure and testing of high altitude diving tables. Decompression in Depth Symposia. Santa Ana, California: Diving Science & Technology Corp. pp. 49–79. Retrieved 2008-04-24. ↑ Bell, R. L.; Borgwardt, R. E. (1976). "The theory of high-altitide corrections to the U.S. Navy standard decompression tables. The cross corrections". Undersea Biomed Res. 3 (1): 1–23. ISSN 0093-5387. OCLC 2068005. PMID 1273981. Retrieved 2008-04-24. ↑ Hennessy, T. R. (1977). "Converting standard air decompression tables for no-stop diving from altitude or habitat". Undersea Biomed Res. 4 (1): 39–53. ISSN 0093-5387. OCLC 2068005. PMID 857357. Retrieved 2008-04-24. ↑ Bühlmann, A. A. (1989). "[Decompression problems in diving in mountain lakes]". Schweiz Z Sportmed (in French). 37 (2): 80–3; discussion 99–102. PMID 2799365. ↑ Bühlmann, A. A. (1984). "[Decompression during lowered air pressure]". Schweiz Med Wochenschr (in German). 114 (26): 942–7. PMID 6087447. ↑ Bühlmann, A. A.; Schibli, R.; Gehring, H. (March 1973). "[Experimental studies on decompression following diving in mountain lakes at reduced air pressure]". Schweiz Med Wochenschr (in German). 103 (10): 378–83. PMID 4144210. ↑ Böni, M.; Schibli, R.; Nussberger, P.; Bühlmann, A. A. (1976). "Diving at diminished atmospheric pressure: air decompression tables for different altitudes". Undersea Biomed Res. 3 (3): 189–204. ISSN 0093-5387. OCLC 2068005. PMID 969023. Retrieved 2008-04-24. ↑ Bühlmann, A. A. (1984). Decompression – Decompression Sickness. Berlin New York: Springer-Verlag. ISBN 0-387-13308-9. ↑ Wienke, B. R. (1993). Diving above sea level. Flagstaff, AZ: Best Publishing. ISBN 0-941332-30-6. ↑ Egi, S. M.; Brubakk, A. O. (1995). "Diving at altitude: a review of decompression strategies". Undersea Hyperb Med. 22 (3): 281–300. ISSN 1066-2936. OCLC 26915585. PMID 7580768. Retrieved 2008-04-24. ↑ Paulev, Poul-Erik; Zubieta-Calleja, Gustavo (2007). "High Altitude Diving Depths". Research in Sports Medicine. Taylor & Francis. 15 (3): 213–23. doi:10.1080/15438620701526795. PMID 17987509. ↑ Morris, B. R. (2010) . Practical Altitude Diving Procedures. pp. 24–27, 50. ↑ "Brush Engineered Materials Mourns Loss of Dr. Charles F. Brush III, Director Emeritus". Retrieved 2010-03-26. ↑ Drake, Nadia. "Nathalie Cabrol: Life at the Margins". University of California at Santa Cruz. Retrieved 2013-03-01. ↑ "Nuevo Records del Mundo para Azimut 360". Azimut 360 (in Spanish). Retrieved 2014-09-23. ↑ Bali, John (October 2013). "My Dive Into the Highest Named Lake in the United States". The Scuba News. Retrieved 2013-10-15. ↑ Hemming, Peter (October 1998). "Lake Tulainyo Up and Under in the Sierras". Sport Diver. 6 (5): 16–19. Retrieved 2013-03-01. ↑ Farr, Martyn (8 February 2007). "South Africa – Bushmansgat". Retrieved 2010-04-30. Altitude Diving Calculator – Online calculator to determine the theoretical ocean depth while scuba diving at altitude.